Shopping for Alien / Aliens Mugs? It's a face-full of delicious Alien goodness! This distinctively intimidating Alien Facehugger Mug from Think Geek features an Alien egg mug with a facehugger handle and base and the "business end" of the facehugger hanging into the mug. Made of ceramic, it holds 24 ounces and measures about 6-inches tall x 4 1/2-inches long x 4 1/5-inches wide. It's the perfect gift for your favorite (or is that least favorite?) crewmate! Hand wash only. Not dishwasher safe. Do not microwave. Whoops, we probably should have paid more attention in Xenomorph Biology 101! We are supposed to let the facehugger near our mouths? Right? That sounds right. 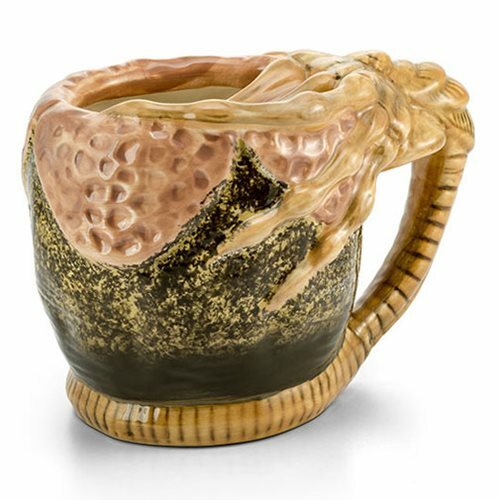 Which makes this Alien Facehugger Mug just perfect! A facehugger, perched atop an open egg, just waiting to gain access to the next open mouth that comes along. Fill it up with your favorite tasty beverage, bring it to your lips, and everything will turn out just fine… probably. You'll feel like a million bucks and burst out singing "Hello! Ma Baby" or something like that. We're pretty sure that's how it works.